School is back in session and you know what that means? Healthy breakfasts and allergy-friendly snacks & lunches. The time of the laid back Summer routine is over but don’t freak out! 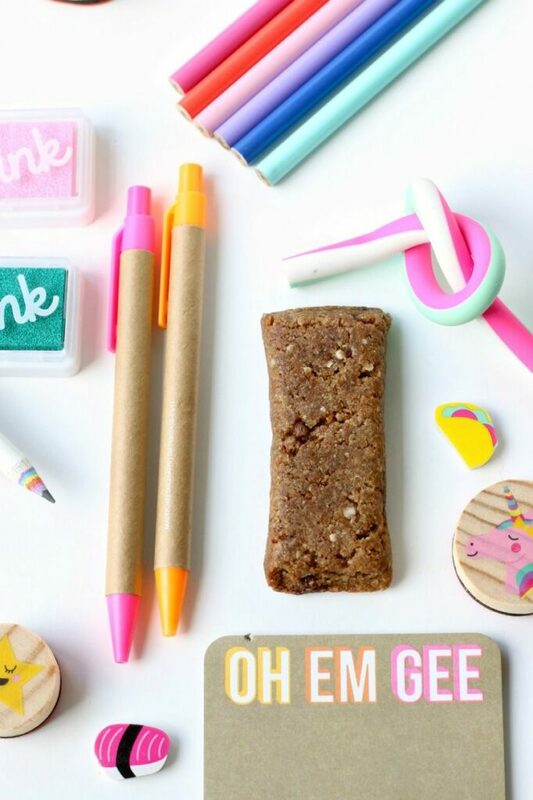 I’m going to show you how easy it is to get back into the swing of things using your favorite Baked Chewy Bar by Enjoy Life Foods (there’s also a special coupon code at the end….so keep reading). My family is loyal to the Enjoy Life Foods brand. 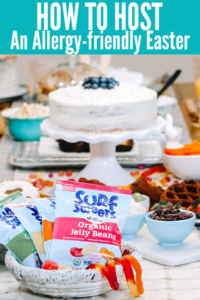 Not only was it the first company that my youngest requested by name, but also it was the first company that made it enjoyable for everyone to eat allergy-free (only my youngest has multiple life threatening food allergies). It’s allergy-safe and delicious which makes Enjoy Life Foods = allergylicious . The Enjoy Life Foods bakery is located in a certified gluten-free and dedicated nut-free facility, removing any chance of cross-contamination. All of the products are free from the 8 most common allergens: peanut, tree nuts, wheat, soy, eggs, dairy, fish & shellfish then go the extra mile by removing sulfites, crustaceans, sesame and mustard to cover Canada’s top 12 food allergens. Their products are also non-GMO, certified Kosher and made with no artificial ingredients. That’s something this mama can stand behind. The need for Free-from snacking is always growing and because of that, Enjoy Life Foods introduced a larger size (15% bigger) + 3 new flavors to their Chewy Bar family. Each bar was created, using their Pure Life Balanced Dry Blend flour (consisting of sunflower kernels, cassava, sorghum & quinoa) before adding innovative ingredients to make these treats stand out. Caramel Blondie– made with bits of dairy-free caramel and mini chips. Carrot Cake– shredded carrots, California raisins and roasted pumpkin seeds pack a ton of flavor into this portable treat. 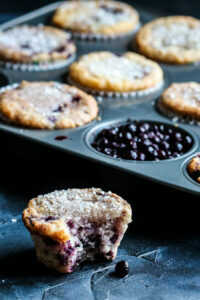 Lemon Blueberry Poppy Seed– tart lemon juice & sweet blueberries create a snack bar that tastes like a breakfast muffin. We couldn’t decide on a favorite flavor, so you’ll just have to try them all and decide for yourself. Pack these in a lunchbox (yours included) + grab a few to fend off the hunger while waiting in school pick up line! Take them to the football game + leave a box at Grandma’s so you’ll have always have a “safe” treat on hand. You can also chop them up, toss them into dishes or cover them with chocolate…really! 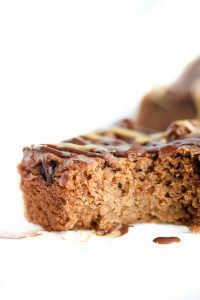 Check out the yummy ways I used each of these bars. My kids love to bake and play with foods in the kitchen. One of their favorite things to do is melt Enjoy Life’s mini chips and dip something in it. Usually it’s fruit, vegan marshmallows or granola bars so why not a chewy bar? Soft & chewy, all-natural caramel flavor + chocolate drizzle = decadent dessert bar. Simply melt your chocolate chips and coconut oil in a small saucepan & whisk until smooth. 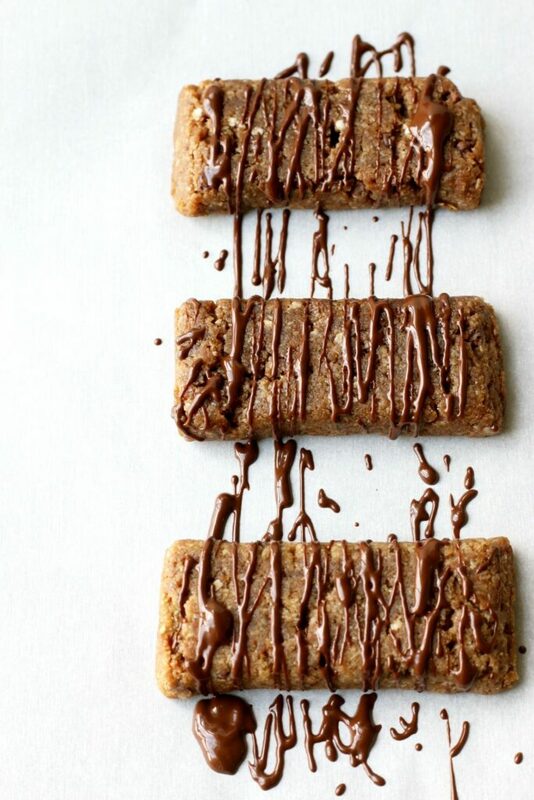 Lay down a sheet of parchment paper then place bars on top & drizzle with chocolate. Enjoy Life Foods (which we lovingly call ELF for short), also has allergy-safe mixes which is what I used for this next “hack”. Instead of making a plain muffin I decided to jazz it up with a carrot cake topping. 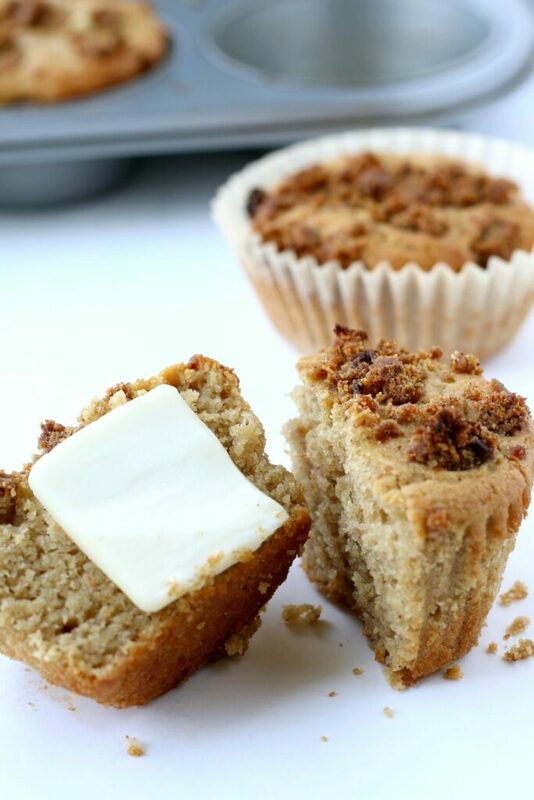 The results were fabulous and the crushed chewy carrot cake bars turned gave these little muffins a streusel-like topping. I recommend eating these warm with a big ‘ol slab of vegan butter! Follow the recipe on the back of the box BUT before you put it in the oven, crumble a bar or 2 and sprinkle on top of the muffin filling. Bake as instructed & enjoy for breakfast or in your lunchbox. Last but not least, a healthy breakfast. My kids don’t actually like chia seed bowls because of their texture but when you top it with a bunch of fresh fruit + berries then sprinkle on chewy bar crumbles, that’s a different story. Lemon Blueberry flavor just bursts through every bite, making this a fabulous granola substitute. 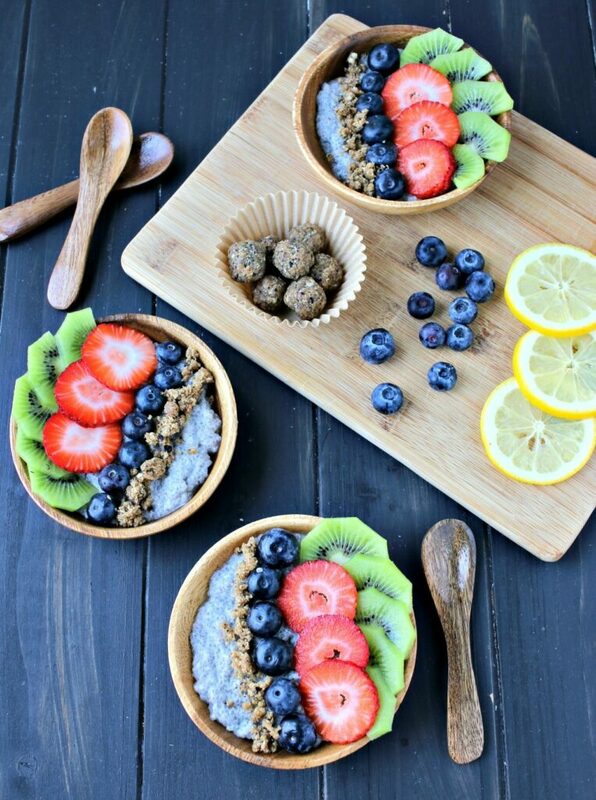 In a medium bowl, mix together chia seeds, coconut milk & vanilla extract. Stir together and let sit 20 minutes (or overnight) stirring mid-way. If you like a thinner chia pudding, add a little more coconut milk. Refrigerate until ready to use then top with crushed chewy bar and fresh fruit. Excited to try the new Baked Chewy Bar flavors?! Grab your discount code then order here. Enjoy 20% off single boxes of the 3 new Chewy Bar Flavors with Code: CHEWYBLOG until September 15th. This post was sponsored by my partnership with Enjoy Life Foods. As always, all recipes, ideas and opinions are my own. Collaborating with brands I love allows me to keep bringing you new and varied recipes! Thanks for your support! Nice! Love the pics. Well written. Bravo! Can’t wait to try these hacks! Such great ideas. 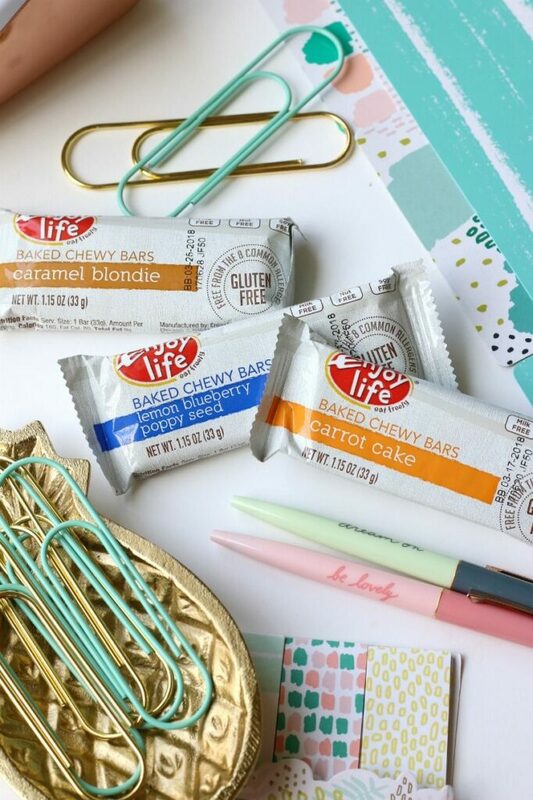 I love these Enjoy Life bars…and my kids do too. Perfect for school snack or lunch time. Don’t you love having snacks you know are safe and healthy for the whole family? What awesome ideas! I need to pick up some of these bars. I haven’t tried them yet. I don’t have kids, but I wouldn’t mind having any of these snacks myself! I eat them all the time! I love that its a snack everyone can enjoy. These are slow clever Nicole! I think I’m going to have the chia bowl tomorrow – I have everything on hand, including those yummy blueberry lemon chewy bars! I love Enjoy Life chocolate chips. I haven’t tried their bars, but you’ve convinced me to try them. so impressed that you were able to make a bar into a muffin, how creative! Thanks! Really, I just used it as a mix-in and topping, but loved how it turned out. I love your photos, and those muffins? Yes please! Those muffins were gone in a flash! What fun ways to reinvent a food. I love how you can see so many uses beyond just a bar. Thanks Kortney. Reinventing is much more fun. I love the photos of the bars with the stationary. Seriously so cute!! Aww, thanks Megan. It was so fun buying all those little school items. Made me miss those days indeed. All three of the flavors that you shared sound amazing! Plus, the photos are stunning and make me want to dig right in!